Demosthenes son of Demosthenes of the deme Paeania (384-322) is generally regarded as the greatest of the Attic orators. At the age of seven he lost his father and was entrusted, along with his inheritance, to guardians. When he turned eighteen, however, he discovered that most of the money was gone; and so, after studying under Isaeus, Demosthenes took his guardians to court in 364. He delivered his first speeches (27-31) in these cases, and their success launched his career as a speechwriter. 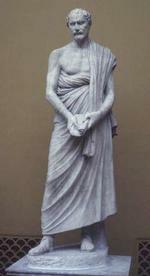 Demosthenes’ long and illustrious political career began in 355, when he composed speeches for the trials of Androtion (22) and Leptines (20). In the latter half of the 350s he continued to write forensic speeches for high-profile cases (24 “Against Timocrates”, 353; 23 “Against Aristocrates”, 352), and also delivered his first speeches before the Athenian Assembly, including “On the Symmories” (14) in 354, “For the Megalopolitans” (13) in 353, and “On the Liberty of the Rhodians” (15) in 351. Demosthenes rose to prominence as the foremost Athenian opponent of Philip II. In 351 he delivered his “First Philippic” (4), in which he called for a more aggressive stance toward the rising threat of Macedon. In the three “Olynthiacs” (1-3) of 348 he urged his countrymen to send aid to Olynthus, which was under Macedonian attack; but the auxiliary expeditions sent by Athens could not prevent Philip’s capture of the city. In 346 Demosthenes took part in the embassies to Philip regarding the “Peace of Philocrates;” on his return from the second embassy he accused several fellow ambassadors, including Aeschines, of taking bribes from Philip, and he attacked Philip for negotiating in bad faith. Despite his dissatisfaction, later in the year he delivered the speech “On the Peace” (5), counseling the Athenians to abide by its terms. For the remainder of the decade Demosthenes continued to agitate against Philip at home and abroad, delivering the “Second Philippic” (6) in 344 and “On the Chersonese” (8) and the “Third Philippic” (9) in 341. In 343 Demosthenes brought Aeschines to trial and gave the oration “On the False Embassy” (19); Aeschines escaped a death sentence by a mere thirty votes. Demosthenes’ policy of resistance to Philip triumphed, but the resistance itself failed at the battle of Chaeroneia in 338. Nonetheless, Demosthenes remained influential at Athens. In 336 Ctesiphon proposed that Demosthenes be awarded a gold crown for his public services; Aeschines brought an indictment against Ctesiphon for making an illegal proposal, but the case did not go to trial until 330. At Ctesiphon’s trial Demosthenes delivered his most famous oration, “On the Crown” (18), and Aeschines was soundly defeated. Lamia (in text as “Lamian”).